Pinterest is photo based social networking site made up of virtual bulletin boards. Presently it’s the most highly valued startups by venture capitalists in the world. With millions of people looking to buy and sell homes everyday – Pinterest has become one of the hottest online social media platforms. Buyers and sellers can no longer underestimate the global reach of this site. If you aren’t using it….you could be missing out. Whether you’re looking for your next family or vacation home – you can search anywhere in the world…from anywhere in the world. Moving out of state and want to know about schools and things to do in the area? Find a board that has all of the topics that interest you. Pinterest is an invaluable resource and your new best friend. While it can be used to plan a wedding and search for the perfect dress or cake – it is sometime overlooked for the role it can play in real estate. Following a few Pinterest boards will help you see homes that you might not have noticed before. Unlike Facebook – you follow a specific board not a specific person. This way you are only getting information that is of interest to you. If you are looking for a home with a state of the art kitchen – you can find a board that only lists homes with this specific detail. Share boards with your realtor to be sure that he/she understands your specific taste. Looking to list your home and in need of some easy inexpensive staging tips? Follow some fabulous staging bulletin boards. You will get some great ideas to help your home sell quickly. Pinterest is increasingly becoming one of the hottest social media platforms online, with millions of visitors daily looking to buy and sell homes. Feel free to browse the millions of Pinterest boards to find the ones that make you happy. 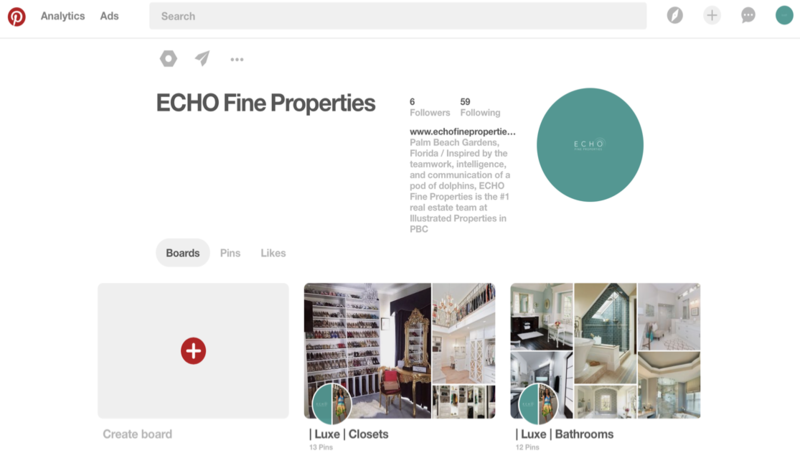 Be sure to check out all of the wonderful boards on our Echo Fine Properties Pinterest page too! Looking for a home in BallenIsles? Be sure to check out my new listing on our Pinterest page! Want to see it right now….ok…click here. Penny Burke is available to handle all your questions and real estate needs. Give her a call at (561) 320-2567 or email her at Penny@EchoFineProperties.com. Posted in BallenIsles, BallenIsles Homes, BallenIsles homes for sale, Mirasol, Mirasol Condos, Mirasol homes, mirasol homes for sale, Mirasol real estate on March 27, 2017 at 12:48 pm.